Everyone loves our place! You will too! Location, Location, Location!! This remodeled and decorated 'Vintage' model has the best location in the whole resort. It is located on the 14th Fairway with the view of the water in front of the green. Enjoy the view as golfers try to shoot over the water. Take 35 steps out the front door and enjoy the pool and spa. 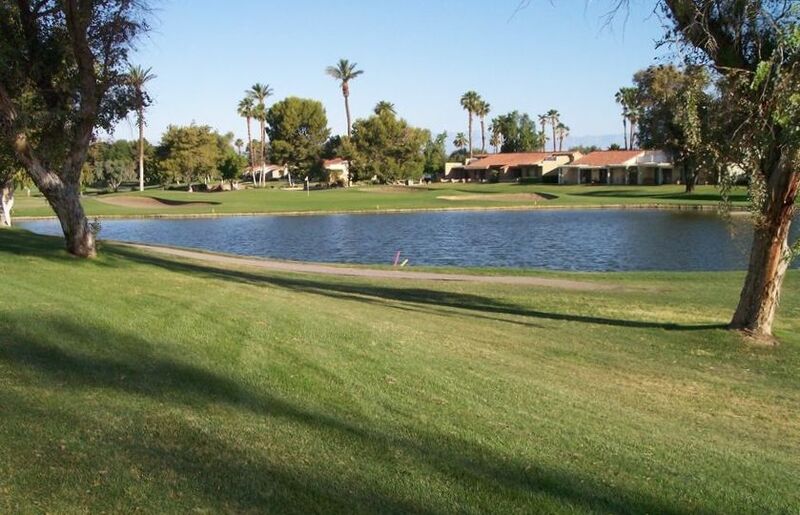 Palm Desert Resort Country Club is a beautiful oasis in Palm Desert. It is a gated community that offers an outstanding golf course, full driving range and practice area at reasonable rates. It also has 16 Tennis courts with many that have lights. In season it also offers an excellent restaurant, bar and social activities. Our unit is beautifully and tastefully decorated. We have a king size bed in the MBR with very nice Dark Cherry furniture. The other bedroom has two Queen size beds with Mission type furniture. There are TV's in Living Room and both bedrooms. The Kitchen is fully furnished (better than most homes) with everything you need to cook your own meals. The back area is all windows and sliding glass doors. Giving you good light and beautiful views. Also good window coverings when you want them. This is a location and unit where you can come relax and enjoy yourself. If you are not familiar with this area, it has everything. It is one of the great golf and tennis meccas in the country. It has high end shopping at El Paseo as well as one of the largest outlet shopping areas in the country. It offers lots of night life as well as Las Vegas type Casinos. Enjoy the quiet of the resort or venture out to all the area has to offer. Full kitchen with everything you need to cook with. 35 steps away. right across the small street. Great Location in Palm Desert close to restaurants, food stores and entertainment. The condo unit had all the amenities we required to enjoy our stay. The pool & sauna was easily accessible just across the street. Enjoyed the Palm Desert Resort Golf Course. Gary, the owner, was approachable and answered all our questions before we arrived. Hope to come again! Thank you so much. We were happy to have you stay at our place and hope you can come back again soon! Condo was nice and roomy with fully equipped kitchen and lots of storage. Pool and hot tub right across the street, was great. We really loved golfing at the resort and enjoyed an occasional meal and entertainment at the Clubhouse on a Friday night. Gary the owner was excellent to deal with and gave us lots of information. We found the condo to be everything we hoped for, the owner was very responsive to any questions and the golf course was in excellent shape. We were apprehensive about the meal at the clubhouse but were surprised with one of the better meals we have had in some time! Comfortable Roomy Condo and Owner Great to Deal With! The four of us enjoyed our recent stay in your clean condo. Nice decor and very comfortable beds. Watching the golfers attempt to make shots over the pond was entertaining while we ate breakfast and lingered over coffee on the patio; or relaxed with refreshments after a round of golf. Our grand daughter loved the pool. The close proximity to the pool was enjoyed by all of us. Relaxing in the hot spa after a day of golf was very soothing. The mountain views from the patio and the pool are so serene and the warm California sun is calling us back. We look forward to returning. Cleaning fee $95.00 per stay. $500 Refundable Deposit. $200.00 Air cond. fee during summer months. City taxes are paid for any rentals of less that 28 nights.